sAdhangkaL nAnkinOdum sangkathamAm — and are split in to four types of varNams – brAhmaNar, King, Businessmen, agriculturist (referring to the fourth sect) and everyone is expected to follow these in unison. 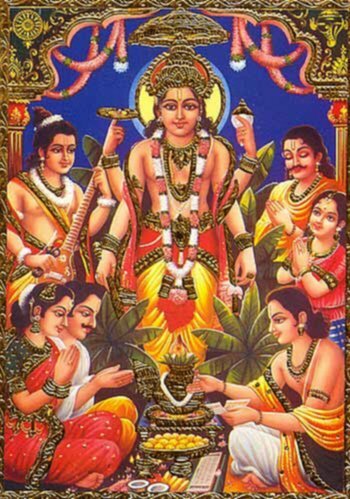 evvuyirkkum indhirai kOn thannadiyE kANum saraN –– all the jIvAthmAs have to take refuge at the feet of the hero of thirumAmagaL, sriman nArAyaNAn. There arouse a question: “Till the time that one is alive, he or she is going to be impacted by the differences in varNam. No one can be spared from that and would continue to follow anyone until the time he lives here”. svAmi aruLALa perumAL emberumAnAr answers that in this pAsuram by saying that “there is no use of those varNam” and then goes ahead and says that all jIvAthmAs have to take refuge under the lotus feet of the ONE who is the hero of thirumagaL . bUthangkaL aindhum porundhudalinAR piRandha: swami thirumangai AzhvAr says “manju sEr vAn eri nIr nilam kAlivai mayaki nindra anju sEr Akai”. thiruvaLLuvar says “suvai oLi ooRu Osai nAtRam ivvaindhin vagai therivAn katE ulagu”. The above two excerpts means that entities like land, water, fire, air and ether combine together to form bodies. With this, we can infer that there is no connection between a body and a soul as the latter is made of the five entities. In addition, the body is one that undergoes a lot of transformations constantly as seen in newly born, young, adult and old stages of life in a man. On top of it, it is temporary and one that needs to be loathed. Hence, it is clear that this body is just a temporary place for the soul. sAdhangkaL nAnkinOdum: There are four varNams that includes brAhmaNar, king, businessmen, agriculturist. “sAdhangkaL” would mean varNam. These four varNams was born out based on the body that originated through the combination of five aforementioned entities. enna payan peRuvIr: svAmi aruLALa perumAL emberumAnAr asks the worldly people as to what do they derive out of such differences. The answer that is implicit in his question is that there is no benefit derived from these differences. The thing that stands out of all these is that these varNam differences creates and propagates the concept of “yAn” (I) and “yanadhu” (mine) that are eventually detrimental to a soul. The phrase “podhu nindRa ponnangazhal” means that sriman nArAyANan’s lotus feet is common for everyone. This is the reason why they keep satAri at the head of all those who come to the temple. 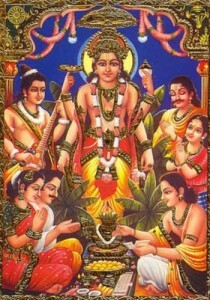 The “satAri” is supposed to be svAmi nammAzvAr who represents the lotus feet of sriman nArAyANan.